Do you enjoy watching high-definition DVD movies? If you have a smartphone like the iPhone 6 Plus, you might be missing out on your favorite form of entertainment because the device lacks the DVD drive for you to play these movies directly. Also, DVD movies are generally in large sizes and you need to make them smaller whilst retaining the original quality if you want to save and watch your favorites on iPhone. How to put a DVD on iPhone? Thankfully, all is easy as you can make your DVD movies playable with a quick conversion tool. Read on to find out how you can rip and convert DVD to iPhone 6S. 6, iPhone 6 Plus, iPhone 5S, iPhone 5C and any other iPhone model compatible format with ease. Insert your DVD into your DVD-Rom. Then click the Load DVD button to import the DVD movies or click the drop-down menu of "File" button to add files to this DVD ripper. Video presets for iPhone 5S, iPhone 5C, iPhone 5, iPhone 4S, iPhone 3GS, etc. are provided. You can just simply select the icon of the iPhone model as the output video format to get videos with optimizes settings for iPhone. At last, click the Start button to begin converting DVD movies to iPhone5 or other iPhone model immediately. The conversion will be finished only in a few seconds. It's not a big hassle with the help of Aimersoft DVD Ripper to stream DVD to iPhone. It can rip DVD movies to iPhone 6S/6/6/Plus, iPhone 5C, iPhone 5S, iPhone 4 or 4S, etc. supported MP4/MOV/M4V and other regular video formats like AVI, WMV, MKV, FLV, 3GP, etc. and even extract audio in MP3, WAV, WMA, etc. for play anywhere you like. In addition, it comes with a built-in editor that lets you to edit your DVD movies by trimming, cropping, adjusting video effects, etc. 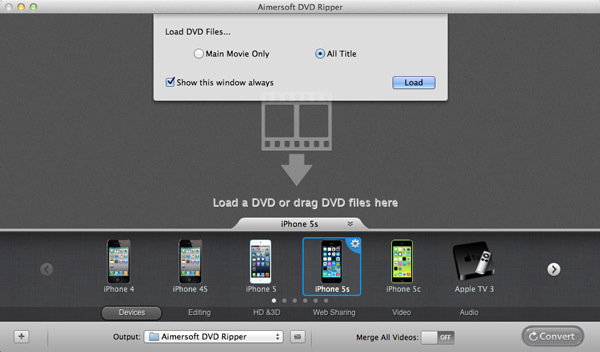 If you're finding a Mac DVD to iPhone converter, the equivalent Aimersoft DVD Ripper for Mac will give you a hand in ripping DVD movies to iPhone 5S on Mac OS X (Yosemite, Mountain Lion and Mavericks included). Now just download the program and follow the easy guide below to convert and transfer DVD to iPhone 5C, iPhone 5S, iPhone 5 for entertainment. Insert a DVD into your Mac and launch the program. Then click File -> Load DVD to import the DVD movies you want to rip. DVD to iPhone converter for Mac allows you to preview the DVD movie, take snapshots and choose subtitles and audio tracks. 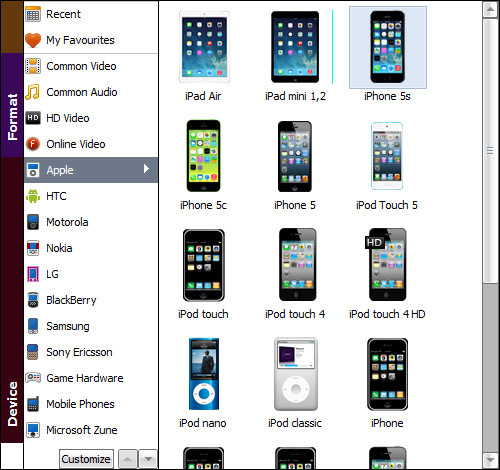 Directly choose the iPhone model you get from the output format list on bottom of the main window of the program. After all the settings, click the Convert button to start converting your DVD movies to your iPhone. After a while, you can enjoy your favorite DVD movies on your iPhone. What makes DVD to iPhone Converter better than other applications? This DVD converter for iPhone supports all kinds of DVD. It can easily remove any copy protection off commercial DVDs, like region protection, Sony ARccOS, UOPs, APS, CSS encryption, etc. Besides, you can also convert Video-TS files and ISO to iPhone videos. 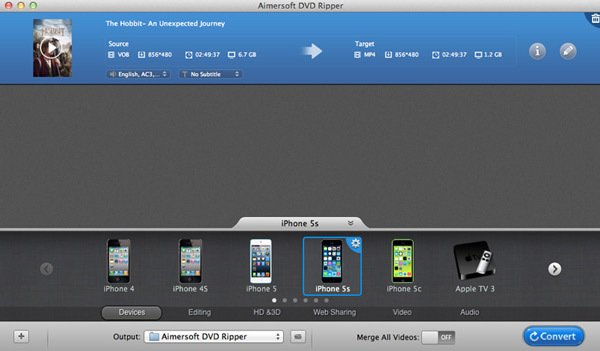 Aimersoft DVD to iPhone converter offers 8 ready presets for iPhone, including iPhone 5S, iPhone 5C, iPhone 4S and more. Though, if you can't find your cellphone model, you can surely create a custom preset for it. It's extremely easy! When the DVD to iPhone ripping process is done, this converter will automatically add your converted DVD movies to iTunes Library. Hence, you can sync all the movies to your iPhone and watch them without any barriers. This DVD to iPhone converter lets you retrieve DVD information, like film name, cover, actors, directors, screenwriter, tagline, description, release date, genre and more. All information comes courtesy of TMDb (www.themoviedb.org). Will this work for the iPhone 5? Thank you for your interest in our product. Yes, it supports BlackBerry as well. Just download it and have a try, it can help you achieve that. My phone is BlackBerry instead of iPhone, can this tool help me as well? It works, but I just hope the conversion speed can be faster. With just two steps, I can enjoy my DVD movies on my iPad. How awesome! When I show my favorite DVD movie on my iPhone 4S to my friends, they are so surprised. And they all ask me to tell they which tool I use. It is really easy to use. That’s what I want! The speed is fast. Amazing! I love my iPhone more because of this product. It is very convenient to watch my favorite videos on iPhone.